“Navel blockades, in time of war, are legal. The UK had every right to establish a maritime exclusion zone around the Falkland Islands as part of the war of 1982. In doing so, the UK used the legally accepted wartime tactic of a navel blockade. Israel is doing the same thing, only much closer to home. Naval blockades always take place in international waters. (If you want to check the law, see the San Remo Manual on International Law Applicable to Armed Conflicts at Sea, 1994. The 2010 flotilla caught Israel off-guard (Go-on!) : they had ignored our warning signs (first soldiers only had crowd control equipment and paint balls lol) at their peril and it was wrongly presumed that, as had been the case with previous and subsequent attempts to break the naval blockade of Gaza, the event would end peacefully. Untold damage was done to Israel’s reputation abroad and we managed to undermine Israel’s legitimacy received vast media attention. The May 2011 flotilla is a joint venture organised by three main bodies: the ‘Free Gaza’ campaign, The Eauropean Campaign to End the Seige on Gaza, and the IHH – Insani Yardim Vakti or Foundation for Human Rights and Freedom and Humanitarian Relief. However, in order to understand what lies behind and links these three organisations, it is necessary to look further afield. The Federation of Islamic Organisations in Europe(FIOE) is a Brussels-based umbrella body set up in 1989 with strong ties to the Muslim Brotherhood, links to Hamas and largely funded by Gulf sources. One of the FIOE’s sub-organisations is the European Council for Fatwa and Research which is headed by Yussuf Qaradawi (love him! ), a prominent spiritual leader within the Muslim Brotherhood, who is renowned for the issuing of fatwas supporting suicide bombing in Israel. Qaradawi also heads the Union of Good – an umbrella body of charities which support and finance Hamas – set up in October 2000 to support Hamas activity during the second Intifada. In 2002 the Union of Good was proscribed by Israel and in 2008 it was designated a terrorist supporting organisation by the United States (Like they can talk). Since the 2007 Hamas-Fatah split, organisations coming under the Union of Good umbrella have been at work in Palestinian Authority controlled areas to strengthen Hamas’ influence there and prevent the replacement of armed conflict with negotiations aimed at reaching a peace agreement. The Palestinian Authority and its Prime Minister Salam Fayyad have taken steps to outlaw Union of Good affiliated bodies there. What does all this have to do with the upcoming flotilla? In 2009 an IHH activist was deported from Israel after he tried to set up an office in Judea and Samaria and transferred money to an organisation known for making payments to the families of suicide bombers. (so GUILTY of what?) The IHH has a permanent representative in the Gaza Strip – Mehmet (Mohammed) Kaya. 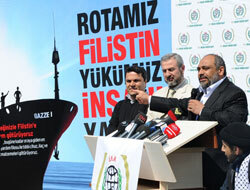 The president of the IHH, Bulent Yilidirim, took part in the 2010 flotilla aboard the Mavi Marmara. 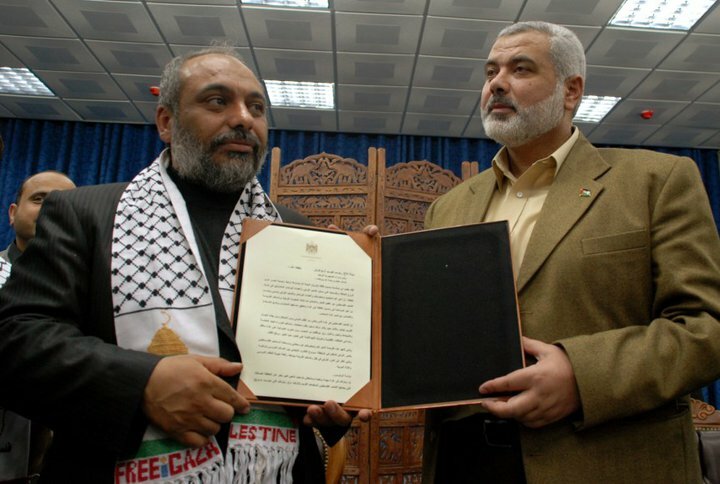 Bulent Yildirim with Hamas leader in Gaza, Ismail Haniyeh. In 2007 the Federation of Islamic Organisations in Europe set up the “European Campaign to End the Seige on Gaza”. In theory, the ECESG is a Brussels-based organisation but in practice it operates out of the same north London offices as used by the Palestinian Return Centre (and several of the personnel of the PRC) – some with known Hamas links – are active in the ECESG. Arafat Madi Shukri was a co-founder of the ECESG, functions as its Chairman and is also operations director for the PRC. General Director of the PRC Majed al Zeer is also involved with the ECEG and the PRC spokesman, Zaher al Birawi also functions as spokesman for “Viva Palestina”. The PRC, founded in 1996 in rejection of the Oslo accords, was also outlawed by Israel (Outlawed? Like Robin Hood?! Lol) due to its Hamas and Muslim Brotherhood links. Another person involved with both the PRC and the ECESG is Gaza-born Sameh Habeeb, who also established and runs the “Palestine Telegraph” which has been the subject of much controversy due to (amongst other things) its promotion of Holocaust deniers and the infamous Aftonbladet libel against Israel regarding alleged organ theft. Habeeb caused further controversy when he invited the far-Right Hungarian politician Krisztina Moravi of Jobbik (loved it) to speak at the Palestinian Return Centre and then threatened objectors with legal action. Current spokesman for the ECESG and the upcoming May 2011 flotilla is one Rami Abdu, a Gazan PhD student at Manchester Metropolitan University who until moving to the UK in 2009 acted as spokesman for the Gaza-based pro-Hamas ‘Popular Committee Against the Siege’. Like the IHH, the ECESG was also involved in the organisationof the 2010 flotilla, among others. Despite its Hamas links and the fact that Hamas is proscribed by the European Union and Britain, supportersof the ECESG include Clare Short, Lord Ahmed, Baroness Jenny Tonge, Brian Iddon and Roger Godsiff. The third organisation involved in the organisation of the 2011 flotilla is “Free Gaza” (my favourite). At least three of its officials – Adam Shapiro, Huwaida Arraf and Great Berlin – were also instrumental in the establishment of the International Solidarity Movement (ISM) which is known for its Hamas ties. The two British suicide bombers who attacked a Tel Aviv bar in 2003 are known to have met with ISM members beforehand at a memorial event for another ISM activist, Rachel Corrie. Established in 2008, ‘Free Gaza’ has representatives in Gaza itself and its endorsers include such well-known names on the anti-Israel activism scene as Noam Chomsky, Jeff Halperof ICHAD, Naomi Klein, John Pilger, Irish Sinn Feinn Parliament member Aengys O’Snodaigh and British peer Jenny Tonge – who also supports the ECESG and was formerly a patron of Sameh Habeeb’s ‘Palestine Telegraph’. Delegations to the May 2011 flotilla are being organised in around twelve countries including Ireland, the United States – where the ISM is recruiting‘experienced non-violent resistance volunteers’ – and Britain. In the UK the organisation is under the banner “Britain 2 Gaza” and is a coordinated effort of several bodies. These include the British Muslim Initiative (BMI) – an offshoot of the FIOE affiliated Muslim Association of Britain which was founded in 2007 with many of the same functionaries as MAB. The president of the BMI is Muhammad Sawalha (also a member of MAB). Sawalha is a Hamas activist (they’ll probably call him a “terrorist”) who has been living and operating in the UK since the early 1990s and one of the signatories of the “Istanbl Declaration”, along with Daoud Abdullah of MEMO and the PRC. Sawalha also has links with the IHH – according to their website he is the organisation’s co-ordinator in Europe – and was involved in the organisation of the previous flotilla as well as having been involved with ‘Viva Palestina’ road convoys. In December 2010 he spoke at an IHH rally in Turkey along with representatives from ‘Free Gaza’ and the ECESG. Also involved in the British campaign are ‘Friends of Al Aqsa’ – the leader of which, Ismail Patel, is a member of the BMI and sailed aboardthe Mavi Marmara in 2010 – the Palestine Solidarity Campaign (PSC – Jenny Tonge is also one of their patrons), the Stop the War Coalition (StWC) and an organisation known as the Palestinian Forum of Britain which has as it spokesman the same Zaheer al Birawi as also works for the Palestinian Return Centre and ‘Viva Palestina’, and is a member of the Muslim Association of Britain. Both the PSC and StWC are supporters of the annual “Al Quds Day” pro-Iranian regime rally, along with ‘Friends of Al Aqsa’ and the MAB. Obviously, the link between all the above organisations is their support for Hamas and their rejection of a negotiated two-state solution to the Palestinian-Israeli conflict in favour of a ‘one-state solution’ – either explicitly, or implicitly via the influx of millions of descendents of Palestinian refugees to Israel, effectively meaning the end of Jewish self-determination. It is also very obvious that the ‘Freedom Flotilla 2’, like the previous one, has little to do with the transportation of humanitarian aid to Gaza, but is an elaborate exercise in public relations designed solely to provoke another conflict in hopes of further undermining Israel’s legitimacy. Not only was the previous flotilla not carrying any significant aid of value, but its organisers refused to accept Israeli offers of transportation of goods to Gaza through the conventional channels, as accepted by the United Nations. Representatives of the ECESG (don’t forget Hamas) also expressed oppositionto Israel’s easing of the restrictions on goods transported daily into Gaza in June 2010. Details of all goods transported into and exported from Gaza via Israel are readily available. As recently as March 15th 2011, the IDF intercepted the latest ship smuggling weapons into Gaza, highlighting the need for the continuation of the naval blockade on Gaza for as long as the Hamas regime remains at war with Israel. According to the Laws of Armed Conflict, Israel’s blockade on Gaza is entirely legitimate.